For the production of liquid iron Finex process was developed jointly by Siemens VAI and the South Korean company POSCO. This process has been based on the direct use of iron ore fines and non coking coal. Siemens VAI and POSCO are jointly developing this process since 1992. The basic laboratory scale research had been done with a 15 tons/day bench scale unit from 1992 to 1996. The results of this unit were used for the test operations of a 150 tons/day pilot plant in 1999. The Finex demonstration plant of 0.6 million tons per annum was built in Pohang works of POSCO and started production in June 2003. This plant has three fluidized bed reactors. Since February 2004, the demonstrated plant steadily produced at a rate of more than 0.7 million tons per annum of hot metal. Construction of the first commercial plant of capacity 1.5 Mpta started in August 2004 and was commissioned in May 2007. Within the first year of its commissioning the plant reached its stable operation and the stabilized parameters given in Table 1have been achieved. The process is based on direct reduction of iron ore in fluidized beds and then melting of this reduced iron. The commercial plant has used 4 nos. fluidized bed reactors for pre heating and pre-reduction of iron ore and a melter gasifier which is similar to melter gasifier used in the Corex process. The process flow is given in the figure 1. The liquid iron is produced in the Finex process in two steps. In the first step iron ore fines is preheated and reduced to fine direct reduced iron (DRI) in fluidized bed reactors in four stages. The first reactor serves primarily as a reactor for preheating of iron ore fines. Iron ore fines are charged into the series of fluidized bed reactors together with fluxes such as limestone and/or dolomite. The iron ore fines travels in a downward direction through the four reactors where the ores are heated and reduced to direct reduced iron (DRI) by means of reducing gas which is obtained from the gasification of the coal. This reducing gas flows in the counter current direction to the movement of ore. The composition of different gases produced in the Finex process is given in Table 2. Sl. No. Gas Composition in % CO CO? H? N? After leaving the fourth reactor, the direct reduced fines are hot compacted to HCI (hot compacted iron) and taken to a charging bin positioned above the melter-gasifier and then charged by gravity into the melter-gasifier as per requirement. In the melter-gasifier smelting of the direct reduced iron ore fines takes place. Here the charged HCI is reduced to metallic iron and melted. Non Coking coal lumps and/or Briquetted coal fines are charged into the dome of the melter-gasifier. 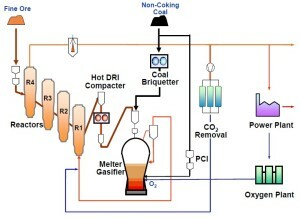 Also pulverized coal along with oxygen is injected into the melter-gasifier. The coal is gasified in the vessel and a reducing gas comprising mainly of Carbon mono Oxide (CO) and Hydrogen (H?) is generated. This gas leaves the melter-gasifier from the top and is directed to the fourth fluidized bed reactor for the reduction of the iron ore fines. A part of the used reducing gas which leaves from the first fluidized bed reactor is recycled back into the system after removing CO?. 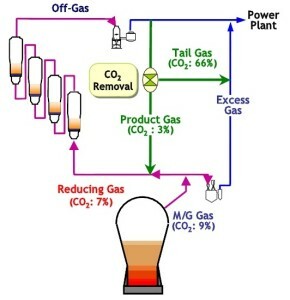 This is done achieve a higher gas utilization rate. The heat generated from the gasification of the coal with oxygen is the energy source for the melting of the HCI to hot metal. It also helps in the formation of liquid slag. Both hot metal and liquid slag are tapped in a similar way as it is done in a blast furnace. The tapped liquid iron (Hot metal) is similar to the quality of the hot metal produced in a blast furnace. The reducing gas produced by the coal gasification is passed through the fluidized bed reactors. The excess export gas generated has a good calorific value and can be further used for DRI/HBI production, steam generation and the power plant. It can use Iron ore fines of size 0-12 mm and with high alumina content. It can use iron ore fines without blending. The process uses non coking low ranked coals. Coal fines can also be used in the process after converting them into briquettes. The process can accept coal lumps and coal briquettes in the ratio of 60:40. The process eliminates Sinter Plant and Coke Oven Batteries which results into reduction in the CAPEX. As per POSCO when compared, the capital costs of the 2X1.5 Mtpa Finex plant along with its subsidiary units is 85% of the costs of 1X3 Mtpa Blast Furnace along with its subsidiary units. The process has independent control of reduction and melting process. OPEX or the operation costs drastically reduce in case of Finex process. As per POSCO the capital cost can be fully dericiated in about 15 months. Finex process is environmental friendly process. It substantially reduces the SOx, NOx and dust emmission levels. The generation of SOx emission level is 19%, NOx emission level is 10% and the dust emission level is 52% of the levels achieved in steel plants with blast furnaces and having environmentally friendly BAT technologies. In Finex process the sulfur mostly of coals reacts with limestone to form Calcium Sulphide (CaS), which is bound in the slag and comes out in liquid slag. Hence there is no possibility for SOx to escape into the atmosphere. NOx emissions rarely occur in the Finex process as the metallurgical reactions take place in the reducing atmosphere in contrast to the oxidizing atmosphere existing during the sintering and coking processes as well as in the hot blast stoves of the blast furnace. Dust emissions are also low due to the closed nature of the Finex process. It has also been observed that no dioxins are generated in the Finex process. 1. What is the minimum capacity of the Plant that can be designed with Finex process? Is it possible to size it for 0.25 to 0.50 Million Tonne Liquid metal capacity per annum? 2. What will be the power generated? 3. Is it a continuous process or Batch process? 4. What is the process pressure? How the Ore fines and coal fines are fed into the furnace without flying out? 5. What is the Steel Melt Shop process suggested to convert the Hot metal into Liquid steel for reduction of Carbon, Sulpher, Silica, and Alumina? Is it possible to produce Special grades with value addition? 6. Is it possible to consume the produced Power within the plant or it needs to be sold out? 1. There is only one size of module available for commercial operation which is 1.5 Mtpa capacity.